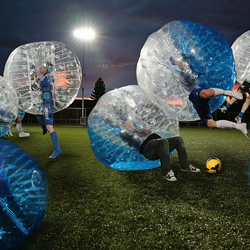 Bubble Soccer is an amazing new sport that takes soccer to a whole new level. 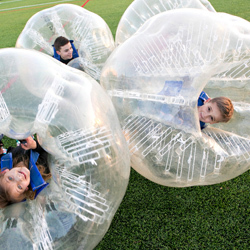 Strap yourself in and enjoy a safe, exhilarating game of Bubble Soccer. Your objective, together with your team is to stay upright, knock your opponents off their feet and score goals. With skills, strength and teamwork you will become a master at destroying your opposition and become Bubble Soccer Champions. Bubble Soccer is enjoyed by all who play and all who watch, as players bash each other to score goals, it’s simply hilarious. This game can also be enjoyed by children, with safe adjustable straps, kids have a blast just knocking each other over, often forgetting to score goals. Our team of refs are there to help them along, assisting during game. 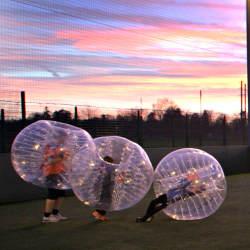 How much fun is Bubble Soccer? The most fun. If you think the videos and photos look fun, wait till you play it. Can you play games other than soccer? Yes, Bubble Soccer Cape Town has designed and added unique twits to the way we host Bubble Soccer events. Not only will you be playing soccer but we will get you doing exciting games and challenges throughout your time with us. How do I put on a Bubble Ball? The best way is to go into one Superman style, hands out front, on your stomach. Then once you are in and have the shoulder straps adjusted, bend your knees, rock back on your heels and push up. Bam, now you’re ready to bounce. How safe are your Bubble Balls? 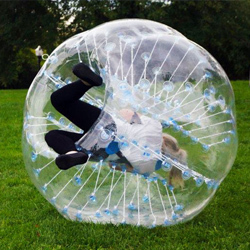 While there is inherent risk to any physical activity, playing in our Bubble Balls is very safe. Whether you are getting blindsided by another player or doing a forward somersault, no one has complained of feeling at risk. What kind of shape do I have to be in to play Bubble Ball? Fairly average shape. 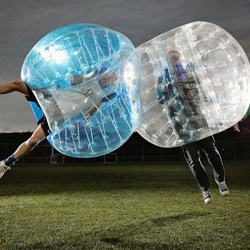 Wearing a Bubble Ball has a levelling effect so that even the most seasoned athletes can be bowled over by a desk jockey. We’ve had people of all athletic ability play without issue. 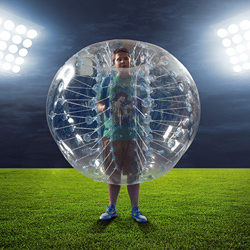 That said, you should check with your doctor before participating in a new athletic sport such as Bubble Ball. Any loose fitting athletic clothing will do. You may want to dress in layers for colder days with the option of being dressed lightly as it can get warm while running around wearing a Bubble Ball. How long are Bubble Soccer games? Game structure varies depending on the type of event you choose but typically games run 60 minutes. How much space do I need to play? For a standard 5v5 game a basketball-court sized field is perfect. Indoors or outdoors. You find a place and we will bring the fun. What about corporate events, birthday parties, bachelor parties and other events? Yes, we do parties, events, and much more. Please contact us to accommodate your event. What about fundraisers or non-profit work? We are interested in partnering with organizations for fundraising opportunities. Please contact us for more information. We currently accept payment by cash or eft. 50% is due for any bookings and the remainder 50% is due no later than 24 hours before the rental date. Yes, you can cancel at least 3 weeks in advance for a full refund. If you cancel after that you will receive a 50% refund. Rescheduling is free.